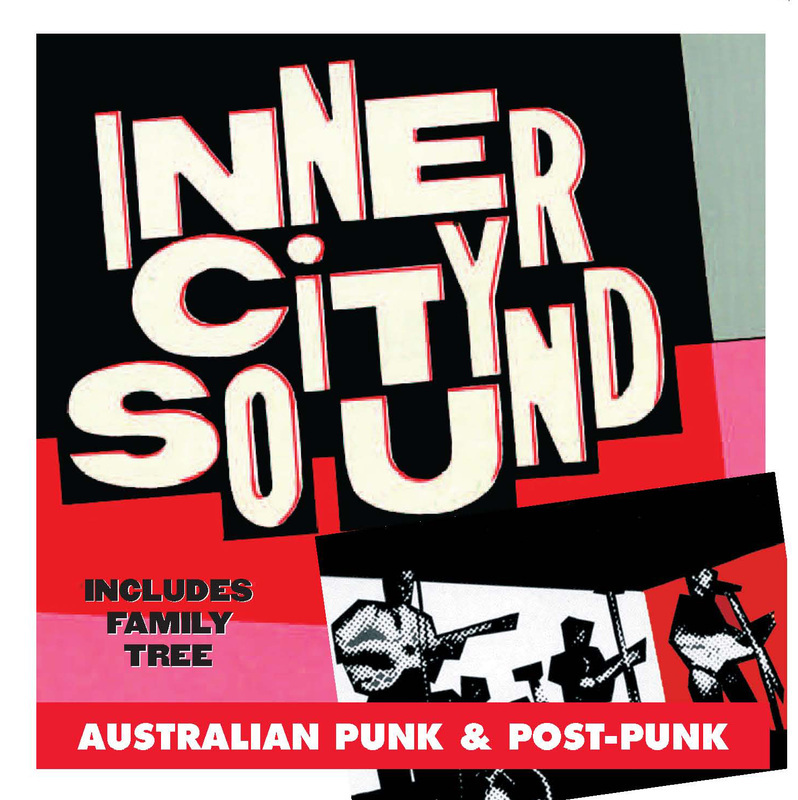 When the new edition of Inner City Sound was due to come out in 2005, I seized the opportunity to do something I'd dreamed about since 1981 - produce an album to accompany the book. And thanks to the good agency of my old friend Stuart Coupe and his Laughing Outlaw label, along with all the artists and other record companies involved, not to mention Don Barltey on restorations and (re) mastering, the Inner City Soundtrack was realised with a minimum of fuss and maximum of result. Its tracklist and liner-notes are reproduced below, along with - another long-standing dream come true - an (expanded) reissue of the Family Tree I originally produced as a one-off poster in 1980, which is attached as a pdf to click onto. The punk cipher reinvented a future for rock’n’roll in the late 70s, and it might only be now that Australia’s getting due credit for its role in that process. At a time long before the internet and instant and virtually unlimited access, Australia’s isolation, tiny population and other such concrete realities might have conspired to impede our music. But in another way, those factors might also have helped succour a certain maverick spirit that, I reckon, is what really distinguishes this collection. Before I went back to the old records – and I’ll be frank, it’s not as if I’ve constantly played the records over the years (you’re always listening to different things) – I was concerned that there would be enough material to make up a good collection. 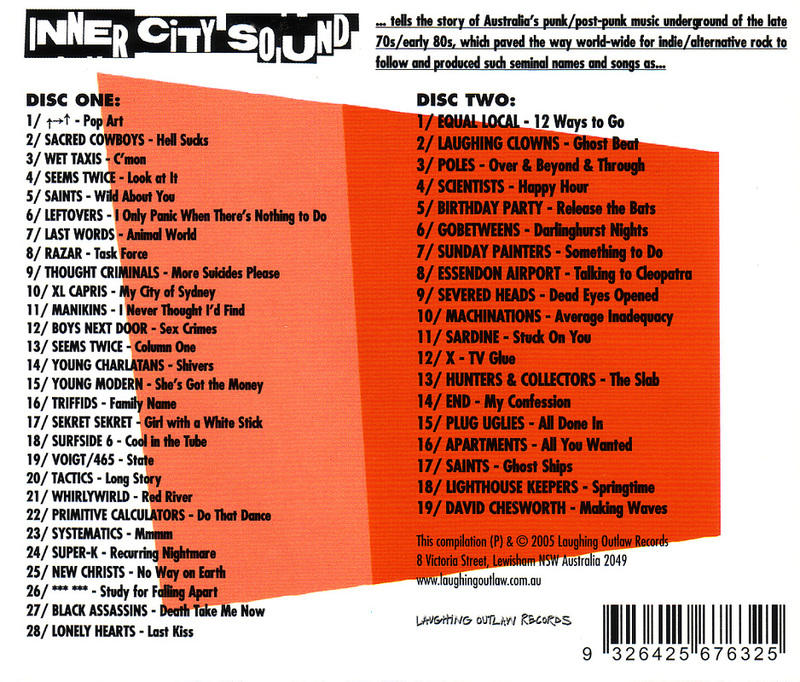 I was worried that everything Inner City Sound so stridently beat its chest about was built on a foundation of sand! But what I was immediately very pleasantly surprised by, as soon as I started spinning all the old vinyl, was just how good so much of it was, how well it stands up. There was still stacks of great records, great tracks, out there. If nothing else, punk was an explosion of vinyl. Part of the new minimalism was getting rock back to singles, rather than indulging itself, as it had been, as a so-called album art form. Punk was the floodgates opening: All of a sudden there was tons of new young bands around and there was just this deluge of vinyl, everybody put out a single because everybody knew you could do it yourself now, and so that was the thing, or a big part of it – if you never did anything but make one single and that one single was a beauty, well, that justified everything, because what more can you expect from a band? One great single is a lot more than lots of other bands achieve, the fifteen-minutes-of-fame theory in perfect action. And so that was why my job became harder – the difficulty became rather what to leave out. During all the years Inner City Sound was lost in the wilderness, out of print, I could never remember if the title was ‘sound’ or ‘sounds’. And now that I know, I also know I got it wrong; ‘sound’ is a misnomer. Because the inner-city indie ghetto – which it wasn’t really at the time, but was becoming – was a ferment of opposing factions, splinter genres and star-crossed loyalties (not to mention bed-hopping and before long, sadly, needle-sharing too). That is to say, it wasn’t characterised by a singular sound but rather a multiplicity of sounds-plural. After punk gave rock the flushing out it so desperately needed, surely this getting back to ground zero, in effect, merely provided a place for rock to re-start out from again (the expansion/contraction cycle that applies equally in rock history as quantum physics). I mean, why get back to ground zero for no reason other than to stay there? You can’t stand still, you die. That’s why the idea of punk as a generic term, as in the Mokhawk’n’Doc Martens caricature, or even according to the Ramones’ ideal blueprint, is to me inadequate at best and misses the whole point at worse. country-rock! jazz-funk! whatever, just as long as you do it yourself! The attendant Family Tree maps out the personal interconnections and cross-fertilisations of a generation of Australian musicians, illustrating the generic breadth, and limits, of the post-punk imperative. I think this collection touches on most of the bases, including even Australia’s paradoxically-named Detroit Sound. The tracklist is not arranged strictly chronologically. It is designed rather to tell the story of the times as I feel them now, set across time and place, or rather places (the inner city areas of Australia’s capitals – all the usual bohemian enclaves). You don’t even have to have done as little DJing as I have to appreciate a groove and a vibe, and that’s what I’ve tried to keep up with this set. It traces a few narrative threads and sometimes, for sake of better developing a theme, it might flash back or forward in real time. Australian bands, away from the pressure cooker hype of London/New York/LA, were sometimes slow getting out of the box, into the studio. (My only regret, if you can call it that, is that one thing you don’t hear on this album is the sound of money, and a little bit of cash towards development and production could’ve gone a long way.) In real time, by about 1984, things were starting to change. Like, even independent charts came in! In the end though, it all just came back to the records, like I said. My only criteria was, Does it sound like a hit, to me? Does it still convince? Does it leap off the plate and bite you? Can it make you smile, or want to move your hips? does it take you somewhere else? I’m not going to spoil it by spelling it all out here though. That’s why this is a soundtrack; the music speaks for itself. And if you do want to know any more – if the Family Tree still isn’t enough – hey, go get a copy of the book. After all, you don’t have to pay eBay prices for it any more!